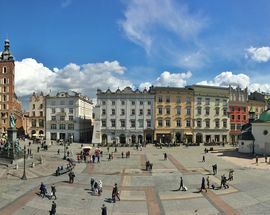 Kraków’s main market square (Rynek) serves as the city’s gravitational centre, and is the natural start and finish point for any tour of the city. 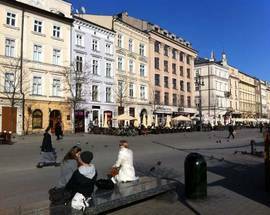 Originally designed in 1257 - the year Kraków was awarded its charter – the grid-like layout of the Old Town and its central square has changed little in the years that have followed. 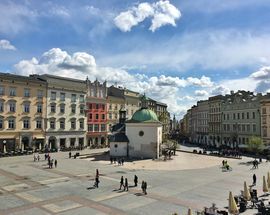 Measuring 200 metres square, the Rynek ranks as one of the largest medieval squares in Europe, and is surrounded by elegant townhouses, all with their own unique names, histories and curiosities. 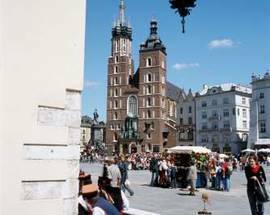 Through the centuries it was in Kraków’s Rynek that homage to the king was sworn and public executions held. 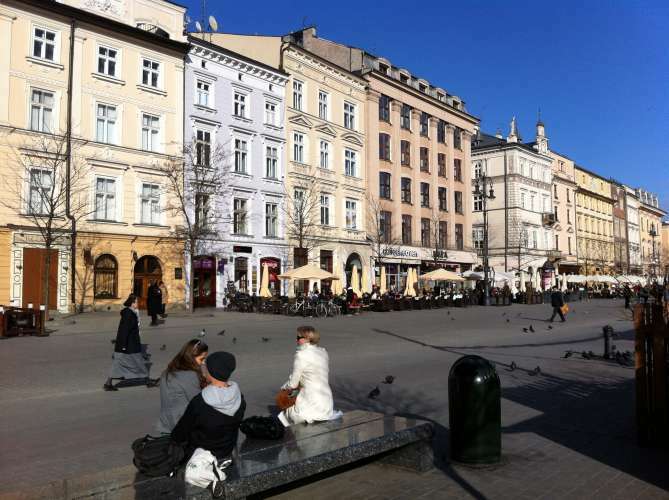 Most famously it was here that Tadeusz Kościuszko roused the locals to revolt against foreign rule in 1794. 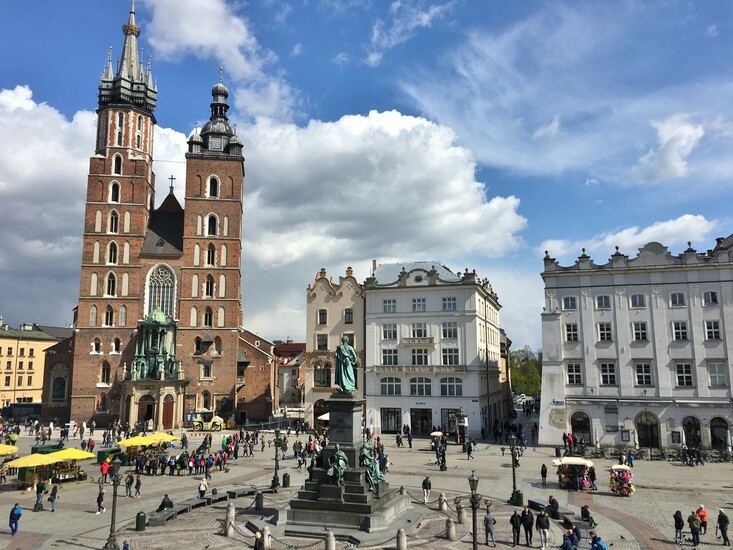 The Rynek has always been the natural stage for public celebrations, with everything from parades of sausage dogs to Christmas crib competitions taking place. Not all the events have had been happy affairs however, and back in the 17th century King Jan Sobieski III was privy to a firework display which ended in bloodshed when some of the explosives were accidentally fired into the crowd. More recently the market square was subjected to a Nazi rally attended by Der Führer himself when the square’s name was changed to ‘Adolf Hitler Platz’ during German occupation. 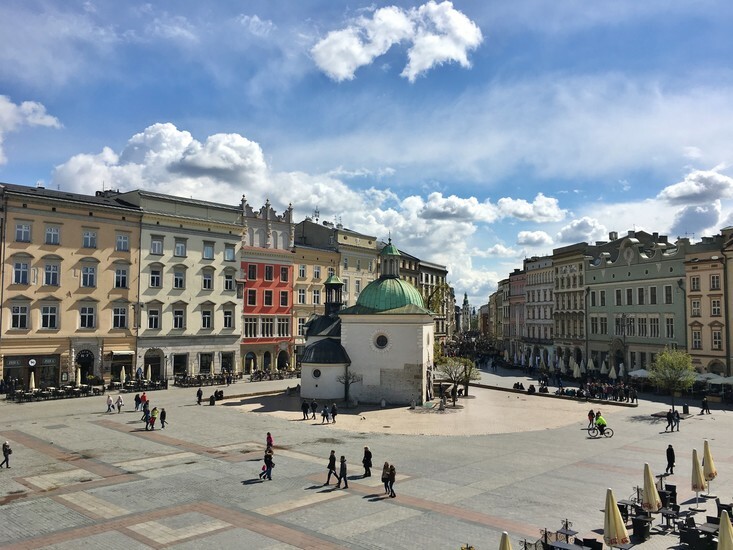 Fortunately the moniker didn’t last long and today the Rynek occupies itself by hosting annual Christmas and Easter markets, as well as numerous festivals and outdoor concerts. 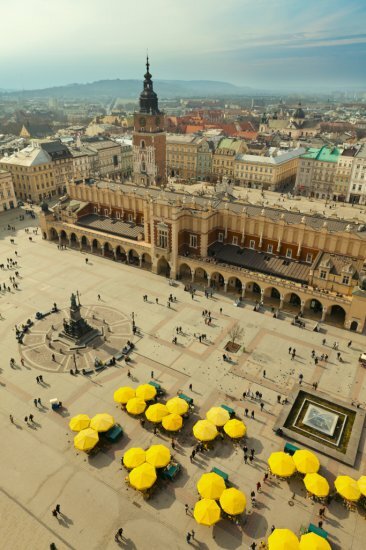 Taking centre stage is the Cloth Hall (Sukiennice). Built in the 14th century this huge hall was effectively the first shopping mall in the world. To this day it is still crammed with merchant stalls selling amber, lace, woodwork and assorted tourist tat. 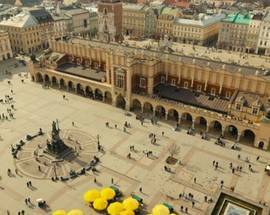 In 2010, Rynek Underground - a 4,000m2, hi-tech museum tracing the history of the Cloth Hall, and that of the entire city - opened underneath it, while the second floor hosts the underrated 19th Century Polish Art Gallery. 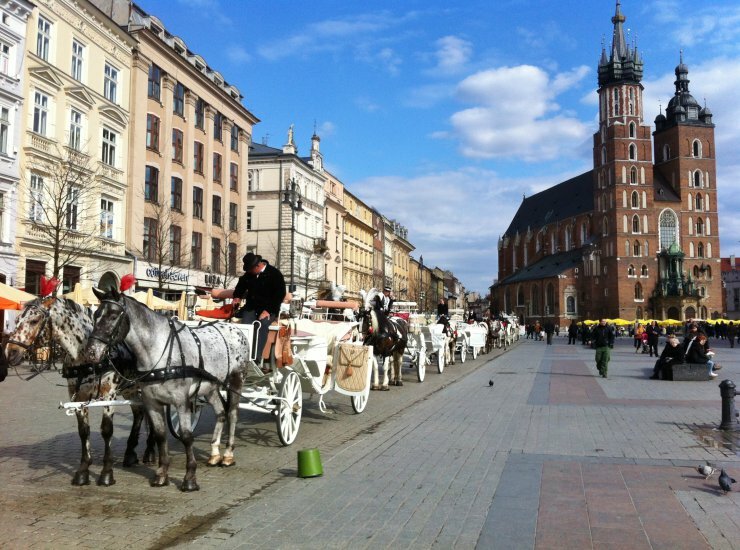 Directly next to the Sukiennice stands Poland’s most eminent scribe: Adam Mickiewicz. 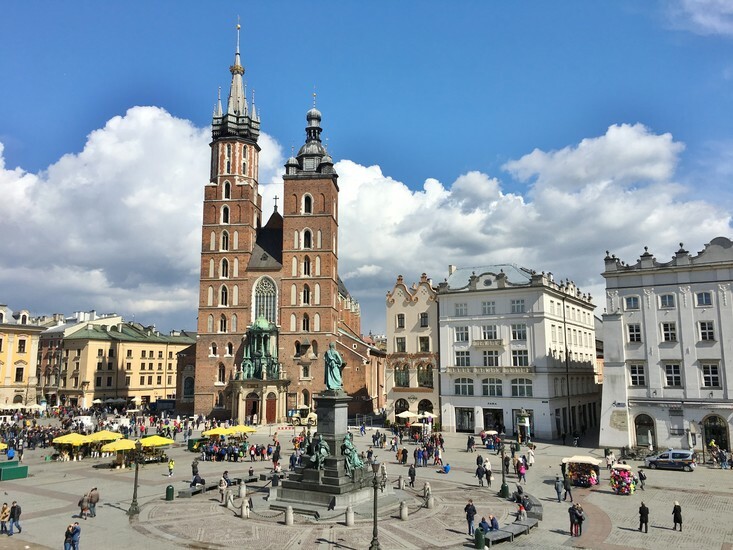 Ironically, the bard never visited the city until after his death when his remains were transferred to the Wawel Cathedral crypt, but this hasn’t stopped the statue from becoming one of Kraków’s best loved monuments. Across from Mickiewicz looms the magnificent St. Mary’s Basilica, its crowning glory being Veit Stoss’ altarpiece. 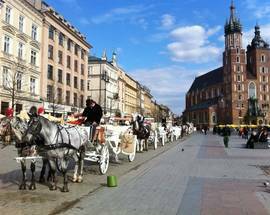 The area surrounding the Basilica was formerly a cemetery, and the bodies of hundreds of Cracovians still lie beneath the cobbles. Ghoulish tourists will also appreciate the set of metal neck restraints displayed on the side door of St Mary’s, formerly used to punish philandering women. 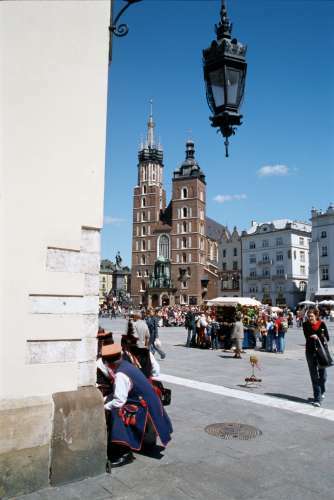 Also, don't miss the famous bugle call played from the tower of St. Mary's every hour, on the hour - one of Kraków's most charming and famous traditions. On the square’s other side is the 70 metre Town Hall Tower, the only element of the 14th century Town Hall remaining after many fires, renovations and uncaring demolitions. 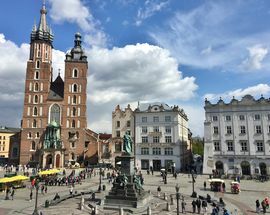 From March until the end of December visitors can ascend up lots of stairs to the 3rd floor through Gothic vaulted rooms which contain, amongst other things, 1960s photographs of Kraków and rather underwhelming views to the west and south. Resources for English-speakers in addition to an English language school. What an amazing Square! Just love to wonder around the area n having a coffee at one of the outside reastuarants both during the day n night. Never bored with this place!